The Battle for Milne Bay in New Guinea was a story of true grit, determination, and valour; it was the moment when the Imperial Japanese Army tasted defeat on land for the first time in nearly three centuries. In the space of two weeks, the Japanese attempt to capture Milne Bay was halted, and any ambitions they might have held to invade Australia, thwarted. 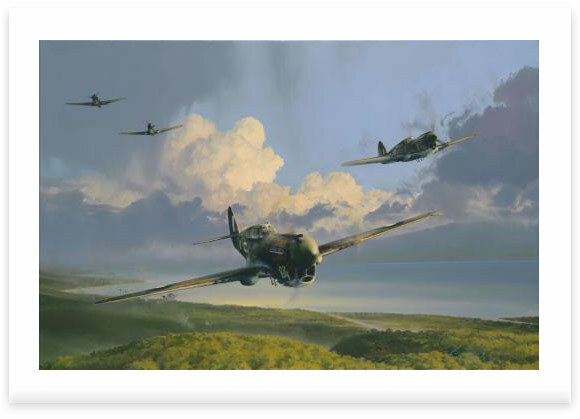 Robert Taylor’s powerful new painting depicts Kitthawks from the 75 and 76 Squadrons RAAF, returning to No 1 Strip after attacking Japanese positions during the Battle for Milne Bay. 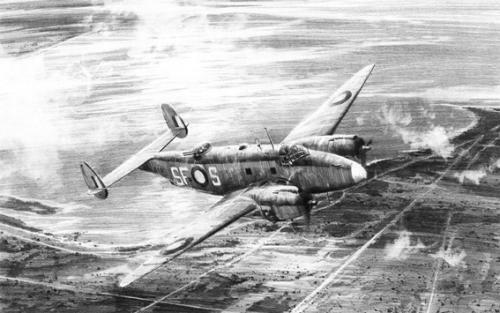 Under the starboard wing of the lead aircraft, ‘Polly’, the smoke of action is clearly visible as the Japanese press from their landing site, along the coast towards the airstrip. 'Polly', now beautifully restored, resides in the Australian War Memorial Museum in Canberra, a tribute to the men and machines that stopped the Japanese in New Guinea. Prints are signed by RAAF veterans who flew and fought in Kitty-hawks with 75 and 76 squadrons at the Battle for Milne Bay. The complete edition has been personally signed by two P-40 veterans from the 75 & 76 Squadrons RAAF that flew and fought at Milne Bay. Each print in every edition has been signed by the artist Robert Taylor, and has been hand-numbered. A lockheed Ventura belonging to 13 Squadron RAAF, navigated by Flight Lieutenant Gough Whitlam, over the northern coastline near Darwin after a martime reconnaissance to search out and destroy Japanese ships and submarines operating in the seas to the noth of Australia.